Location: Red Butte Ranch downstream three miles and then Grey Reef dam downstream 9 miles. Steve and I were up bright and early on Tuesday morning. Ruth was up at 3:30AM as she worked an early shift, but she prepared breakfast for us before she left. After a light breakfast Steve and I dressed warm for a day on the river and migrated to the heated garage where we climbed into our waders. Greg meanwhile put our rods together and rigged our leaders with strike indicators, split shot and flies. I used my toesies from skiing on my feet even though I was expecting to remain in the boat all day. In addition I broke out the handwarmers I’d purchased at Wal-Mart and placed them inside my ski mittens. Greg informed us that our strategy would be to float from the Red Butte Ranch downstream for three miles or so and in this way we would be ahead of the flush. Once we took out, we would transport the drift boat back to the dam and float downstream from there for nine miles to another take out. By the time we started our float at the dam, Greg expected us to be behind the flush with water levels essentially down to non-flush levels. Steve drove his Subaru to the morning takeout with Greg so Greg could park his truck and trailer there, and then the two returned to Red Butte Ranch. Once they returned at 8AM, I helped Greg guide the drift boat across the shallow riffles to a spot just above a deeper drop off and then Steve waded out to join us. I remembered that I forgot my neoprene gloves, so I waded back to the bank and returned to the garage to retrieve them, and then waded back to the boat again. We began with Steve in the rear of the boat, and I took the position in the bow. Greg rigged my 6 weight Scott with an orange egg fly and a purple leech. Steve started with a similar egg fly and trailed a red annelid fly. It didn’t take long before my indicator dipped and I set the hook and I was attached to a heavy fish. Unfortunately as I got the fish close to the boat I realized that it was foul hooked in the dorsal fin. Greg and Steve congratulated me, but I wasn’t as excited as them. The fish was a nice fat specimen in excess of fifteen inches, but I announced that I don’t count foul hooked fish. Greg and Steve took the position that they did and it was harder to fight and land a foul hooked fish than a fish hooked in the mouth. I still wasn’t convinced and maintain the opinion that it is only fair to count fish hooked in or very close to the mouth. We continued on and I landed a second foul hooked fish, but Steve was having better luck in the rear of the boat as he landed quite a few fine hard fighting rainbow trout with several in the 15 – 17 inch range. Eventually we found a spot where I hooked and landed a couple twelve inch rainbows and then added a third as we got closer to the take out ramp. My mouth hooked fish were interested in the top egg fly during this morning drift. The air temperature registed 25 degrees when we began our float at 8PM. I placed my handwarmers in my mittens and kept them beside my seat at all times. Every time Greg rowed the boat from one choice location to the next I inserted my hands in the mittens and grabbed the handwarmers and made a fist. They proved to be lifesavers. By 9:30AM we arrived at our take out location so we aided Greg in securing the boat in the trailer and then we drove west on 220 to the boat launch below the dam and we were back on the water fishing by 10AM. Steve and I switched positions so I began the late morning drift in the rear of the boat. There were quite a few other guides and drift boats along with wade fishermen in this area and Greg knew two of the other guides as they operated out of the same guide service. The first couple of miles below the dam were very attractive with more runs and riffles giving the water more character and making it easier to spot likely productive water. It didn’t take long before Steve and I were hooking and landing fish. 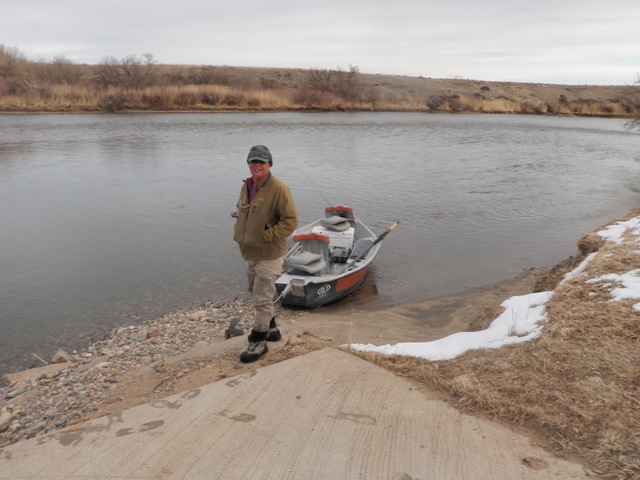 One memorable location was within a half mile of the boat launch where a deep run split the river in half and several wade fishermen were on the left side as we faced down river, and three boats were maneuvering along the right side. Each boat would drift the right side of the run and when they reached the bottom, the guide would row back to the top and repeat the same drift. We probably hooked and landed eight to ten nice rainbows from this area. Eventually we grew weary of this scene and moved on down the river. 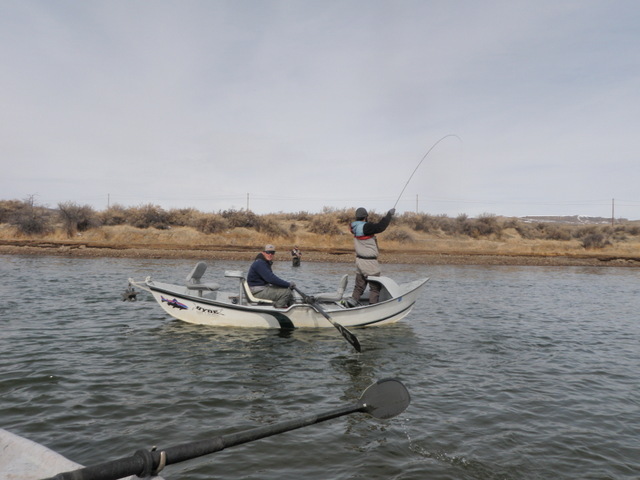 Greg worked the oars and pulled ahead of the other boats, and we continued to find sweet spots in the river where we made multiple drifts and landed many fish. Quite a few of the productive areas looked nondescript to Steve and I, but Greg’s 20 years of guiding on the North Platte River paid dividends as he knew where all the troughs and drop offs were. During this period of the day my line offered a yellow plastic egg fly and a rabbit strip leech with a purple body. Roughly 1/3 of the fish were hitting the leech and the other 2/3 went for the egg. At around 1PM Greg pulled the boat up on the muddy shore and declared it was time for lunch. Our lunches were enclosed in plastic and we munched them down in the boat. After lunch Steve and I once again switched places, and I resumed my position in the bow of the boat, and shortly after we began my indicator dipped and set the hook and I was connected to a larger fish than previously experienced earlier in the day. The fish began to charge below the boat and then surged back toward me and repeated this several times as I maintained a taut line. On one of these cycles Greg spotted the fish and announced it was a large brown trout. I really wanted to land this fish as we had landed only rainbow trout on the trip up until this point. The brown made a hard run up the river above the boat by twenty yards or so and then as I maintained pressure, the line released and fell to the water in a limp state. I reeled up my line thinking that a fly broke off only to find that both flies were in tact and somehow the large brown had managed to work its way free from the fly. Needless to say I was quite disappointed with this turn of events, but I continued to focus on my line and within the next half hour I hooked but failed to land three more rainbows. These also felt like decent fish, probably in the 15-18 inch range. Finally I broke the losing streak and landed a 14 inch rainbow and my fortunes improved from there. Between 1 and 4 we floated the remainder of the nine miles to the take out. The fishing remained quite good and we found numerous troughs and runs that we drifted through repeatedly and caught fish on nearly every drift. Amazingly the average length of the fish we caught was probably around 14 inches and we scoffed at 12 inch fish. At some point Greg swapped out my leech for an annelid worm, but the egg was really my top producer. By 4PM we arrived at the scheduled take out and Greg’s truck and trailer had been shuttled to the parking lot. Once again Steve and I helped Greg crank the drift boat up and out of the river on to the trailer bed. We jumped in the car and returned to Red Butte Ranch where we took hot showers and then drove back to Casper for dinner at Jay’s. As I reflect back on the day I realize it was one of the finest days of fishing I’ve ever experienced. I landed 29 fish in total with perhaps 5 additional foul hooked fish and another 15 hookups that I was unable to land. Over the course of the day I hooked nearly 50 fish and Steve estimated that he hooked in the vicinity of 60. It was rare that I made a drift with my flies and didn’t have some sort of action. Steve and I estimated that we experienced at least 15 doubles where we were both playing fish at the same time. In addition to the nice quantity of fish, the average size was also a nice surprise. Most of the fish were in the 14 to 15 inch range, but I also landed several in the 17 – 18 inch range. 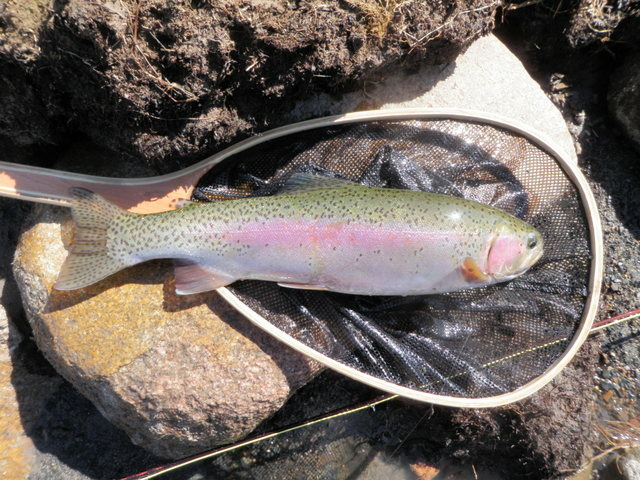 These fish were all rainbows and hard fighters and they featured wide girths making them quite heavy for their length. The weather was very tolerable in the late morning and afternoon as the temperature climbed to the high 40’s and when combined with the periods of sunshine was quite pleasant. Once we moved ahead of the other boats we pretty much had the entire river to ourselves. Greg was an expert guide and coach. He was adept at reading the water and worked hard to provide multiple passes in areas where we were having a lot of success. The North Platte River will remain a destination that I hope to return to in the near future. Each year on the first weekend of January the Fly Fishing Show visits Denver, CO and this year I gave my friend Steve Supple a call and asked if he was interested in joining me. He agreed and we met inside the doors shortly after the show opened on Friday. We browsed the various booths at the show and agreed upon a series of presentations to attend. 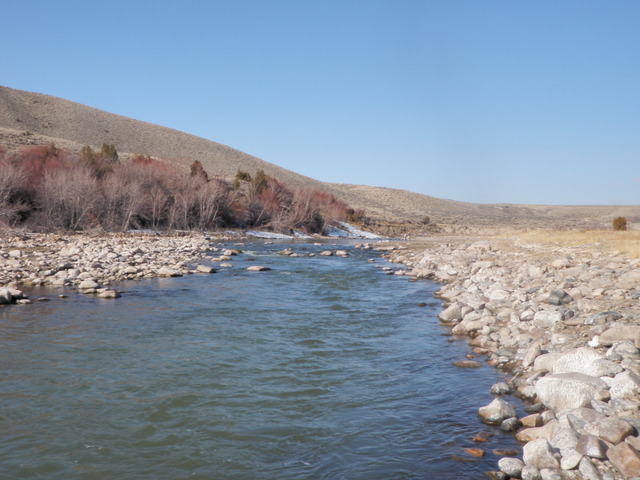 One of the presentations that piqued our interest was the one on the North Platte River in Wyoming and specifically the Grey Reef stretch just west of Casper. Neither of us had ever fished this water in spite of it being only a four hour drive from Denver. Four hours may seem like a long trip, but it isn’t much further than the Frying Pan River and shorter than destinations such as the Conejos River, Rio Grande and Green River. The guide service at the show was offering a special of $300 for a guided float trip if booked and taken prior to April 1. Steve and I agreed to talk closer to March and possibly book a day of fishing on the North Platte. As February flashed by I kept trying to remember to check back with Steve to see if he remembered the presentation and if he was still interested in joining forces for the float trip. I got caught up in skiing and Brady and Kara’s wedding and pretty much gave up on the idea when I discovered an email in my inbox from Steve. Apparently Steve had made plans for another fishing trip, but it fell through at the last minute, and he was interested in doing the Grey Reef trip. I quickly replied back that I was in, and Steve went ahead and contacted the guide service and booked the guide and lodging near Casper. 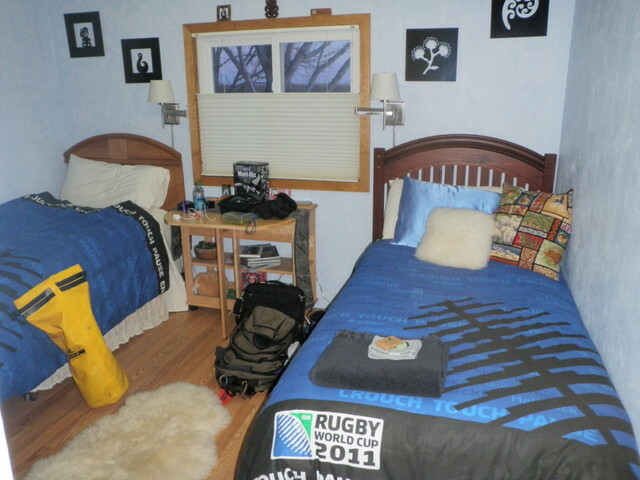 Steve selected the Red Butte Ranch Bed & Breakfast as it was associated with the guide service and offered river access. We made plans to drive to the Red Butte Ranch on Monday, March 25, departing Denver at around 9AM. This would enable us to check in at the guide service and the bed & breakfast and then we could potentially spend a few hours wade fishing the river. The guided float trip was booked for Tuesday and Steve and I decided to do some additional wade fishing on Wednesday before returning to Denver. As the trip approached I kept a close eye on the weather and unfortunately a storm moved into Denver and dumped 10 inches on Saturday March 23. After the storm moved out, the air temperature high hovered around 32 on Sunday and the forecast for Monday was highs of 32 again. I checked Casper, WY on my weather app and learned that Casper could expect a high in the upper 30’s. This was moderately better, but still quite cold for fishing. Highs on Tuesday were projected to be upper 40’s near Casper. Steve arrived at the appointed hour on Monday and we quickly tossed my gear in his Subaru Outback and began the journey. 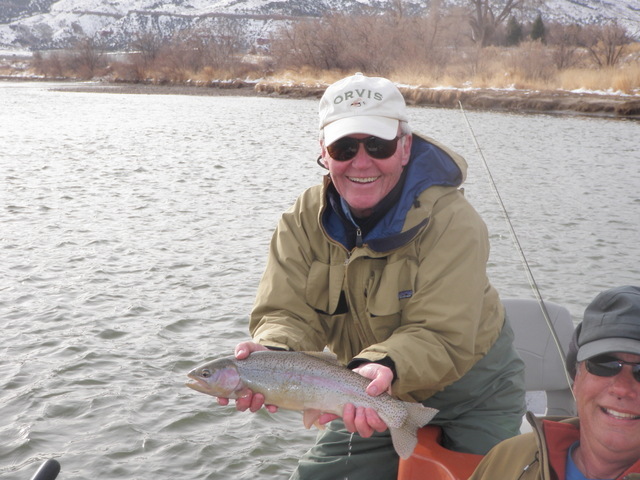 The trip was uneventful and we arrived at the guide service by 1PM and checked in with Liz and paid for our day of guided fishing. Our guide was Greg, and he lived with Ruth at the Red Butte Ranch so this was turning out to be quite convenient. Next we visited the fly shop that was next door to the guide service and inquired about flies. We learned that flushing flows were being initiated from Grey Reef dam, and it was important to work around the releases. The surge of water was released in the morning and then worked its way down the river at a pace of three miles per hour. The fly shop suggested driving to the area below the dam in the late afternoon as the flush would have already moved downstream. The hot patterns were eggs and worms and leeches so I purchased a few of each. The rainbows were in the early stages of spawning so the flush knocked eggs loose and these served as food for downstream rainbows. The high flows of the flush caused the water to go over the bank and dislodge worms, so this explained the success of the worm flies. The worms were referred to as rock worms and annelids. I also purchased a Wyoming fishing license for each of the days we expected to fish, and then we were off to our lodging. When we arrived we met our guide, Greg, and he showed us our room and offered the heated garage as a place to put on our waders and prepare to fish. We took advantage of this and gathered our clothing and gear. I decided to string my rod in the warmth of the garage as I anticipated cold numb fingers once we arrived at river’s edge. The drive to the river was approximately nine miles and we pulled into a nice dirt parking lot next to the river. We were right below the dam and quite a few fishermen were circling the pool created by the torrent of water gushing out of the large pipe at the bottom of the dam. I put on my neoprene fingerless gloves and wore my down vest under my waders. Steve and I moved over to the river and began fishing a series of nice stairstep runs between the dam and the boat ramp. I decided to go with the nymphing setup that Taylor Edrington taught me and added a chenille egg and red annelid below the thingamabobber. Almost immediately Steve hooked and landed a couple fish, but I wasn’t having any luck and after five minutes or so I became snagged to something on the bottom of the river. The water was too deep to wade close, so I ended up snapping off both flies. I retreated to the bank and labored to replace my flies as the cold temperatures now began to take their toll on my hands. There was a mild breeze as well that enhanced the evaporation and that in turn further chilled my fingers. I managed to tie on another pink egg and a red San Juan worm that I made myself as I’d only purchased two of the annelid style flies at the fly shop. Once again I began casting to the seam and softer water between me and the strong run approximately twenty feet away, and once again I got snagged to the bottom. This time I decided to wade out a bit in an effort to save my flies, but alas, this proved to be futile and I broke off two more flies. I was pretty frustrated at this point, but to make matters worse, I stumbled on a rock as I waded back to the bank, and caught my balance by thrusting my right arm into the river. I prevented a full dunking, but my three layers on my arm were now soaking wet and I gashed my middle finger on my right hand on a rock. The small wound began to bleed so I walked down to Steve and asked if he had bandages. He told me he had some in the car in a green bag, so I returned to the car. By the time I reached the car my hands were so cold that I could barely feel the scrape, but I found a towel in my bag and dried my hands and placed a bandaid around my finger. I plunged my hands into the deep pockets of my down vest and held them there for quite a while until they were warm enough to resume fishing. I was really regretting leaving my ski mittens in the suitcase back at the ranch. When I returned to the river, I decided to abandon the area that had created an hour of frustration and moved downstream below Steve. Finally in a nice riffle area the indicator paused and I set the hook and battled a fine 17 inch rainbow that grabbed my chocolate San Juan worm. At least all my frustration paid dividends with a fine fish landed as my first fish of 2013. I continued working my way down the river and managed to land two more rainbows on a chocolate San Juan worm. By six o’clock Steve and I were on the verge of shivering so we decided to quit and return to the warmth of the lodge. 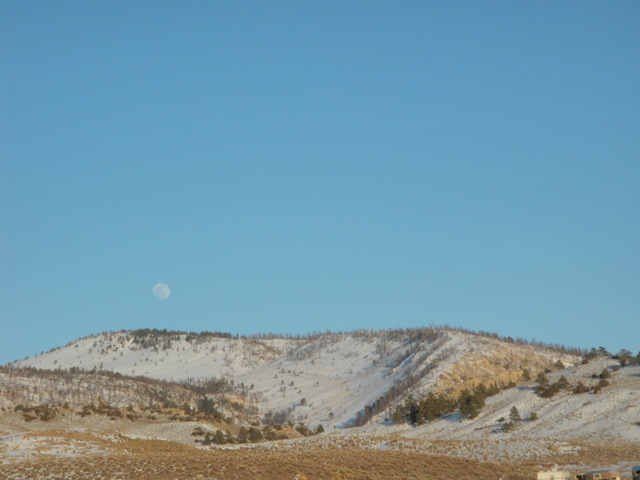 It was a great move, and after hot showers, we drove back to Casper and ate dinner at the Armor Silver Fox. After dinner we found the nearby Wal-Mart and I purchased some hand warmers. Greg suggested that we get up by 6:30 so we could get an early start on Tuesday. All I could think about was how cold it would be that early in morning on a day forecast to reach a high of 49 degrees. While attending the wedding of Brady Young and Kara Worrell on March 15 in Silverthorne I had a chance to catch up with Brady’s father, Fred, and Dave Gaige, the father of another member of the wedding party. I discovered that Fred and Dave were joining up for skiing during the middle of the week. They invited me to join them on a future day trip, so we exchanged emails and coordinated a ski day on March 20. 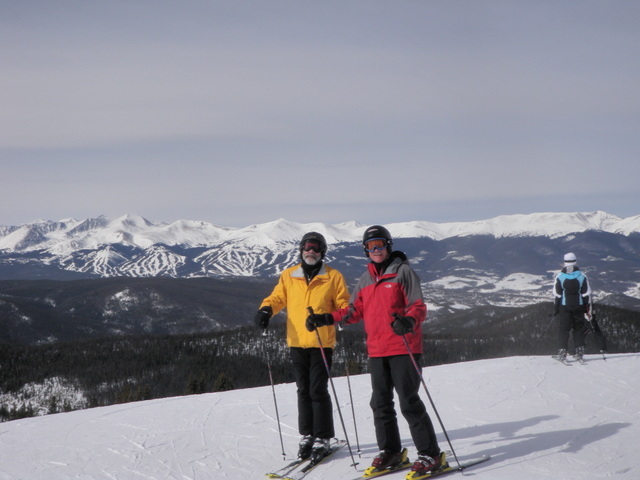 We decided to spend the day at Keystone as it was the closest ski area covered by our Colorado Passes and Fred needed to return for a 5:30 meeting. Fred spent two months renting a condo in Dillon, and joined a 50 and over skiing group on a regular basis at Keystone, so he served as our guide. It was great fun as Fred took us on numerous off the beaten track runs that I wouldn’t have tried otherwise. The weather was perfect for skiing with high temperatures probably reaching 40 degrees. It was warm enough that I never felt chilled, but cold enough so that the snow didn’t morph into slush and mashed potato consistency. We skied from 8:30 until 3:15PM, and I was exhausted by the end of the day. Part of this stemmed from the length of time skiing, but we also did quite a few runs and all except two or three were mogul runs. This fun experience made me realize how much I enjoy weekday skiing compared to weekends. Skiing on a weekend introduces numerous hassles into an otherwise fun activity. In Colorado one must rise early in the morning to beat the heavy stream of traffic on interstate 70 and even with a 6:30 start, the traffic can be quite dense for much of the ride. If weather is adverse, driving conditions make the drive even more stressful and time consuming. If one is successful beating the traffic, then an early arrival results, and this typically means starting to ski during the coldest part of the day. Weekend crowds are heavier than weekdays so this naturally entails more waiting in line at lifts and less chance of finding untracked snow. Finding a table for lunch becomes a logistical nightmare, and this detracts from the enjoyment as well. The early start to one’s day means fatigue sets in early, so the Denver skier quits early when the air temperatures are most comfortable and then of course the driver faces the return drive once again typically in heavy traffic. Weekday skiing removes all these obstacles to having fun. Fred and David and I departed at a civilized hour and took our time over lunch. We quit at 3:15, but we could have easily been the last skiers on the lift without any worry over return trip traffic. I definitely look forward to more weekday ski trips over the remainder of the ski season. I first became aware of the lime green trude during a trip to Jackson, WY in the 90’s. I arranged for a day of float fishing on the Snake River and the fly shop where I booked the trip forced me to pre-buy a quantity of flies. I was not pleased with this as I only paid for the flies I used in all my other guided fishing trips, but I went along with the policy and of course at the end of the day I possessed quite a few new unused flies. Among this residual inventory of flies were several lime green trudes. Being the frugal fly fisherman that I am, I rotated a few on to my active fly patch and on occasion tied one on to my line to experiment with their effectiveness. I remember one of my early lime green trude successes was catching some fish on a lake in the Flat Top Wilderness. As time progressed I gained more confidence in the fly and had some nice action on the Roaring River in Rocky Mountain National Park and also caught some decent fish late in the afternoon on the Eagle River. One nice aspect of the lime green trude is the white calf tail wing which creates good visibility in many difficult lighting conditions. Recently I’ve gone to the lime green trude when I spot yellow sallies, but I’ve had mixed results with this. I tend to tie them in size 14, so they may be a bit large for this application. Probably my favorite way to use a lime green trude is as the top fly on a dry/dropper setup generally in combination with a beadhead RS2 or beadhead pheasant tail. 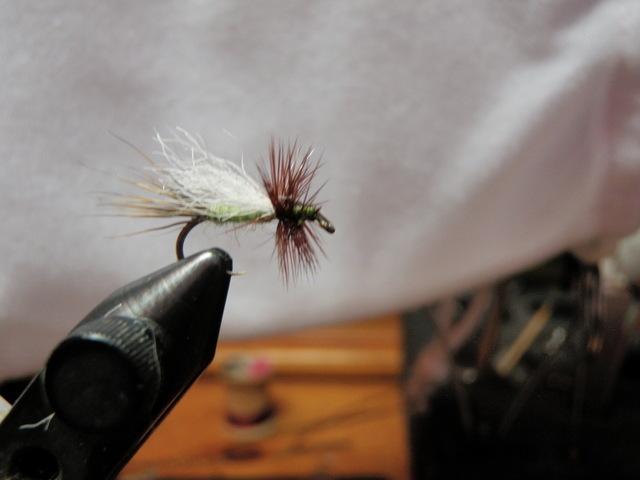 A size 14 trude can support these small nymphs but is probably not buoyant enough to stay afloat above a size 14 beadhead hares ear or larger nymph. I particularly like casting the trude and nymph combination in smooth relatively shallow pools where skittish fish are easily spooked by the increased surface disturbance caused by a larger fly. The original trude pattern calls for a golden pheasant tippet as the tail; however, I’ve substituted a small clump of deer hair, and the fly seems to remain effective. 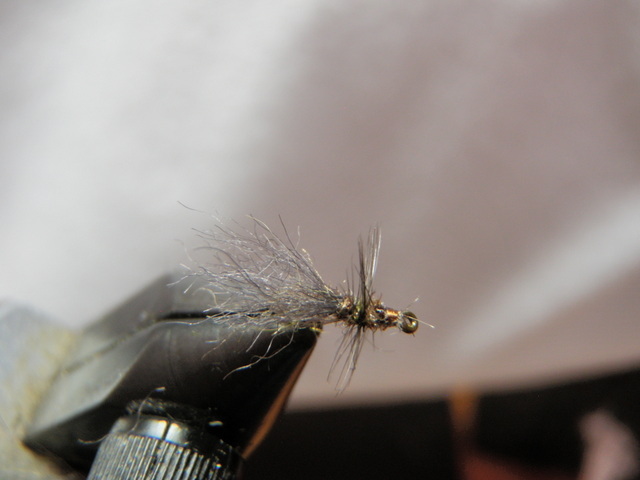 In fact I believe that the deer hair supports the hook better and offers more buoyancy. 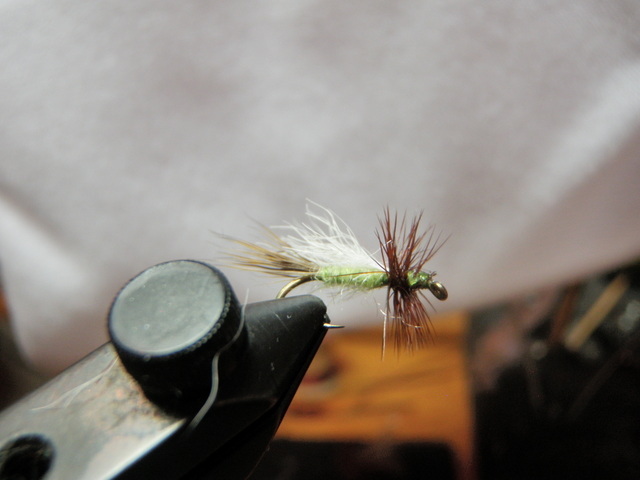 I tied enough additional lime green trudes so that I have around 20-25 as I get close to kicking off the 2013 season. 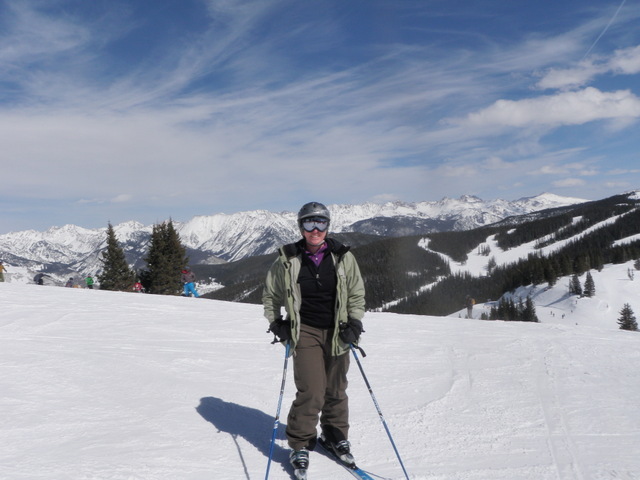 Jane and I took a day off work on Thursday March 7 and used our freedom to visit Vail for a day of skiing. It was a fun day, and I’ll explain why, but it made me realize how much I love the month of March. Certainly September is another great month with the baseball season drawing to a close, NFL and college football kicking in, the NBA pre-season beginning, fall colors moving into full display, and perhaps the best month for fly fishing. Unfortunately I’m also reminded of the impending winter by cooling temperatures and shorter days. March on the other hand is full of optimism and anticipation with the first day of spring and the change to daylight savings time. The NBA season enters the stretch run and my beloved Nuggets are on a red hot winning streak. March Madness goes into full swing, and I love following the brackets and the everpresent upsets. My favorite team sport, baseball, begins spring training, and I once again hear the crack of the bat and the popping of leather as pitchers showcase their best stuff in hopes of landing a roster spot. I love the anticipation of a new season. The ice on our Colorado streams begins to melt away and aquatic insects become active and this prompts the trout to shed their dormancy and increase their calorie intake for the upcoming warmer weather. Those first couple fishing outings on area rivers and streams are special especially when I feel the first throb of a fighting fish on the end of my fly rod. It’s always exciting to spot the first spring bulbs that break through the mulch in our south facing backyard, and raking the raised bed and dropping cold tolerant seeds such as onions, spinach and radishes into shallow rows fills me with anxious anticipation. Seeing these seeds sprout despite the variable temperatures early in the Rocky Mountain spring is very gratifying. St. Patrick’s Day brings the Runnin’ of the Green and Irish music and a festive atmosphere, and I enjoy this as well. On Sunday I ran the 25th edition of the Runnin’ of the Green with my son Dan and friend Kirk, and it was a great time in spite of the 30 degree temperatures. Of course Dave’s birthday pops up in the middle of the month, and it’s an excuse to hear from friends and family and do something special. This year we will be in the mountains and I”m planning some cross country skiing and a couple hours of fly fishing and possibly an outdoor cookout in the snow. This brings me to my most favorite aspect of the month of March…spring skiing. I love spring skiing. The sun is warm and one doesn’t need to worry as much about staying warm, and instead the emphasis is on having fun. Sure the snow can be a bit slushy, but that just makes it softer for controlling ones speed on steep downhills and moguls. The fear of ice is absent, and that translates to an easy going atmosphere. Skiers abandon their thick parkas for zany outfits and in a few cases bikini tops and shorts. 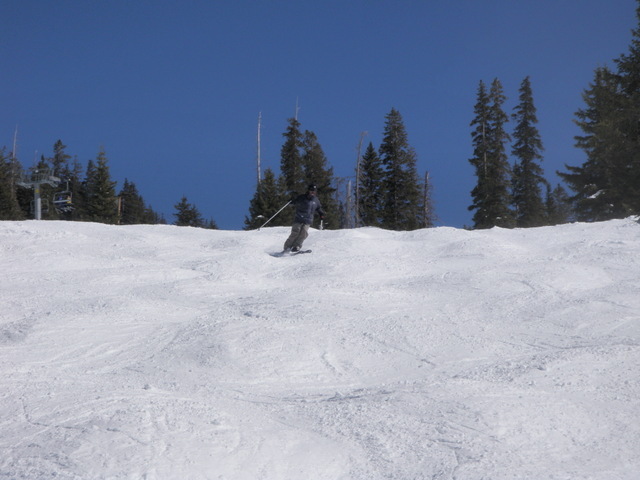 While our day Thursday wasn’t quite as warm as I just described, it was nonetheless a fine warmer-than-usual ski day. There was minimal traffic on our two hour drive to and from Vail, and that in and of itself raises the enjoyment level. We put on our boots and made the walk through Vail Village to the Vista Bahn gondola, and we were on the slopes skiing by 9:30. The area didn’t have fresh snow from the night before, but quite a bit of fresh snow had fallen during the previous week. Jane and I did some nice warm up runs on the front side in the morning and then broke for lunch at Los Amigos at the base of the Vista Bahn. Because of the light weekday crowds we were able to snag a premium table on the deck overlooking the ski area. We both enjoyed delectable tacos and corn chips and soaked up the sunshine and then headed back up the gondola to Mountain Top and worked our way over to Blue Sky Basin. By now the air temperature was peaking in the forties, and we were basking in bright sunshine. We discovered Hornsilver, a run off the right side (facing up) of Pete’s chair, and this quickly became my favorite run of the day. Hornsilver sports nice category 2 and low level 1 moguls, and I blasted through them with quite a bit of confidence. Our last run in Blue Sky Basin was Little Ollie, and this served as my most rigorous test of mogul skiing for the season to date. I can report that I handled the upper stretches in fine fashion, and managed the VW beetle field near the bottom farily well, but I must admit to bailing out a couple times to rest my weary legs. It was still a great day of late season skiing, and I’m anxiously anticipating a few more before March disappears into April. Two thirds of my favorite month still lies ahead. I love fishing green drake dry flies. I’ve encountered them on quite a few streams throughout Colorodao including the St. Vrain Creek, Roaring River, Clear Creek, the Conejos River, Fraser River, South Boulder Creek, Taylor River and the Frying Pan River. The most consistent for me has been the Frying Pan River and it is rare that I don’t encounter them on any trip in August through October. This summer I discovered South Boulder Creek and ran into green drakes on two or three visits to that pretty canyon stream below Gross Reservoir. I was confident I had the green drake fly puzzle solved until this summer. I locked into making green drake comparaduns using microfibbet tails, medium olive dubbing with a maroon thread rib, and a dark deer hair wing. Mistake number one is locking into something and even worse was convincing myself that I had it figured out. My problems began in July when I visited the Taylor River below Taylor Reservoir. 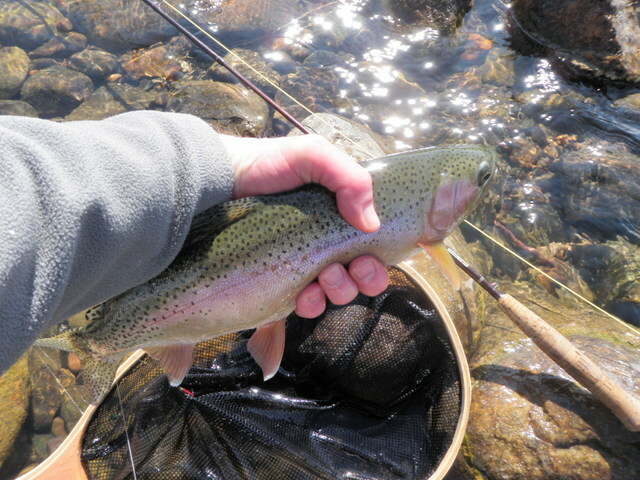 According to the fly shop fishing report I was catching the tail end of the green drake hatch in the upper river near Lottis Creek Campground. Unfortunately my green drake comparaduns were not fooling the fish and in addition my flies became waterlogged and sank shortly after I tied them on to my tippet. I sorted out my flies at the campground that night and discovered that I had both size 14 and 12 comparaduns. The next day I managed to land a fair number of fish on the comparaduns, but I spent quite a bit of time blotting the abdomen and shaking flies in my dry shake cannister. 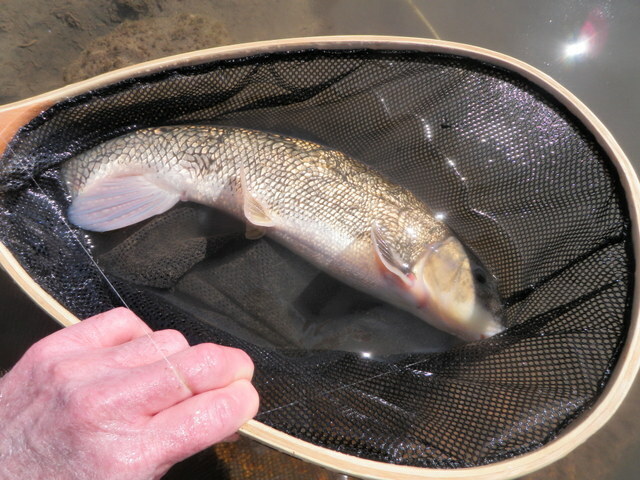 On another outing on South Boulder Creek I ran into the same problem; my flies were too large and they sank too easily. This prompted me to tie a few green drake parachute flies. I tied these on a Tiemco 200R size 12 hook and eagerly transported them along on a trip to the Frying Pan in August. These flies solved the flotation problem, but once again the fish did not show interest in them except for one gullible cutthroat trout. I switched back to the size 14 comparaduns, and these produced nicely during one overcast afternoon near the spring. 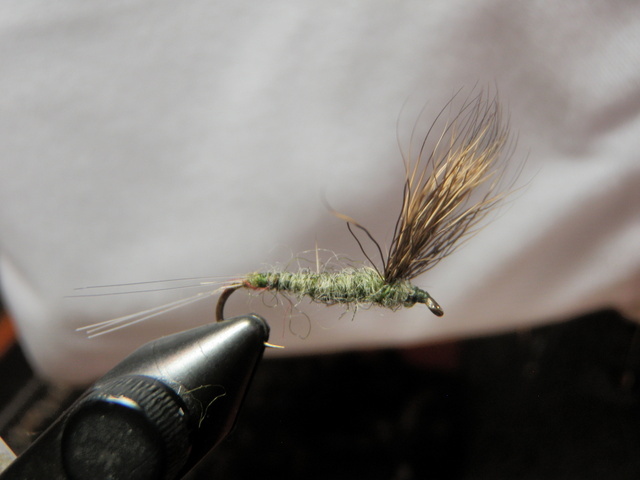 I was now at a stage in my winter fly tying where I needed to stock some green drake dry flies. I decided to do some research on the internet before beginning and discovered there are actually three species of western green drakes present in Colorado. One hatches earlier than the others and is imitated with a size 12 fly. The others hatch later in the season and are best matched with a size 14 hook. This probably explains my inconsistent success when I failed to pay close attention to the size of the comparadun I was using. I also watched a YouTube video of a tyer in Oregon making a parachute green drake and noticed that he used five or six moose mane fibers to create a tail that was much thicker than the split microfibbets I was using. 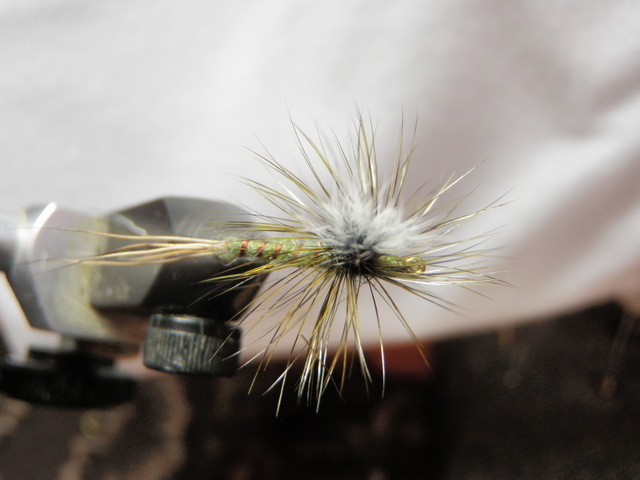 With these observations planted in my brain I sat down and tied eight size 14 parachute green drakes using a moose main bundle for the tail and grizzly saddle hackles dyed dark olive for the hackle. I purchased a nice olive Keough saddle hackle patch at the fly fishing show in January for this very purpose. I’m very pleased with these flies and hope that they will prove effective this summer. Since I already tied three of the larger size 12 paradrakes last year, I plan to produce three additional models so that I have six going into the new season. Fishing large dry flies to feeding trout in a cold mountain stream in summer is one of the most enjoyable experiences I can think of. Hopefully I’ll have a few more days like this in my future. 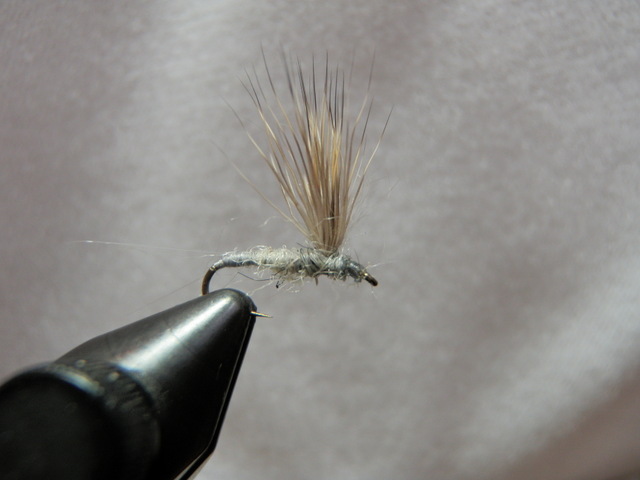 I completed the deer hair caddis and yellow sallies and decided to take inventory of my light gray comparaduns also known as the money fly. I counted ten size 14’s and ten size 16’s and decided to tie an additional 10 size 16’s. This fly has been a great producer for me over the last three or four years, particularly when I encounter a pale morning dun hatch. I’m not sure why the light gray body fly works so well as pale morning duns tend to have a light yellow body in my opinion. The light gray poly dubbing that I use for the body has very slight yellow undertones so perhaps that explains the success. Several years ago my friend Jeff Shafer was scheduled to visit me and fish in Colorado. He asked what flies he should tie before his trip, and I told him about my great success with the light gray comparadun on the Colorado River. He asked me to send a photo so he could tie a few. I was looking for a nice background to photograph the fly against and placed it on the margin of a page of the Wall Street Journal. I told Jeff this was an appropriate choice since the light gray comparadun was a money fly thus the alternative name, money fly. I began skiing after graduate school in 1975 when I was 24 years old. It probably took me a year or two until I progressed from stem turns to decent parallel turns, and while in my twenties I was quite gung ho over the sport of downhill skiing as I progressed rather rapidly from novice to high intermediate. However, the thing I always admired the most in advanced skiers was the ability to ski moguls in control while maintaining smooth form. You’ve seen these freaks…they look like little pistons as their legs absorb every bump and change in terrain while their upper bodies remain unaffected by all the lower body turbulence, and they exhibit this form while skiing directly down a steep fall line. Of course there are also the speed freaks who point their skis directly downhill on a steep groomed slope and attain high rates of speed and endanger all the other skiers around them. They also think they are expert skiers. Another impressive group of skiers are those who invade the trees and swoop off of rocks with no fear evident in their facial expressions. I respect these skiers, and many of these can probably also impress just as much in a mogul field, but the expert mogul skier still tops my list. Another group of skiers includes the crowd that sticks to the terrain park and performs all manner of tricks and stunts on rails and jumps. I can’t even imagine overcoming my fears to execute an aerial flip so I have the utmost admiration for these folks, but as a personal preference, I’d still rather watch a skilled bump skier. So after skiing for 37 years, where am I on the scale of bump skiers? I’d probably rate myself in the top 20% and somewhere around the bottom of advanced and top of high intermediate. I used to think that smooth mogul skiiing required ridiculous quad muscle strength, superb cardiovascular conditioning, and a finely tuned sense of balance and these are certainly useful, but I’ve grown to realize that there are four fundamental keys to success. First comes picking a line. It helps to look for a good line before you start, but being able to adjust on the fly is even more important. Second comes controlling ones speed. A mogul skier will never be able to ski big moguls while continuing to gather speed as one progresses down the mountain. Controlling speed means using the tools provided to edge and slow down, so the third key is making short brief contact with the snow on the tops and along the rounded contours of the moguls. If you hold an edge too long, you are asking for trouble because your weight is too dependent on one ski, and you are likely to quickly lose balance and control. Amazingly the final key is confidence. When I was younger I read article after article about how mogul skiing is a mental game. These articles suggested pausing at the top of the slope to pick a line and then visualize ones smooth navigation through the bunched cluster of snow mounds below. I’ve come to realize that there is much truth to this mental aspect of the mogul game. I group mogul fields into three types. First there are the double black diamond devils with moguls the size of VW beetles with huge deep troughs and in the worst case the troughs are icy from all the novice mogul skiers who ski through them and avoid the large humps. 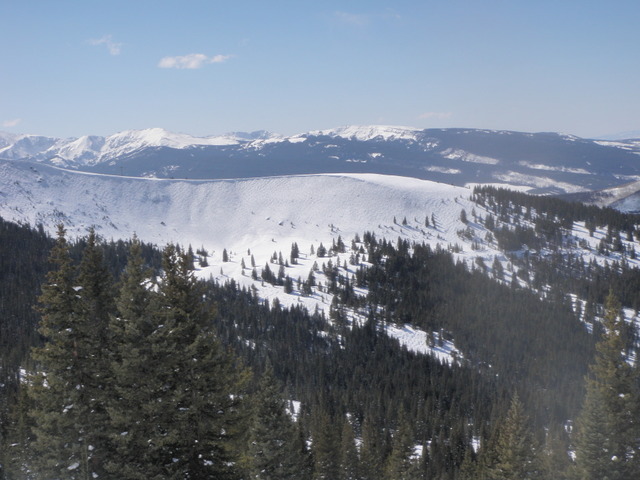 A second category are the moderate sized moguls, still spaced fairly close together, but not separated by the deep ravines present in the category one moguls. The last group is best described as embryonic moguls, a series of clumped crud mounds created by skiers after a fair amount of new accumulation. My favorites are category two, and I find that these are the best stretches to practice the key techniques and build confidence. I still strive for the ability to dominate category one, but I spend more time on category two terrain. 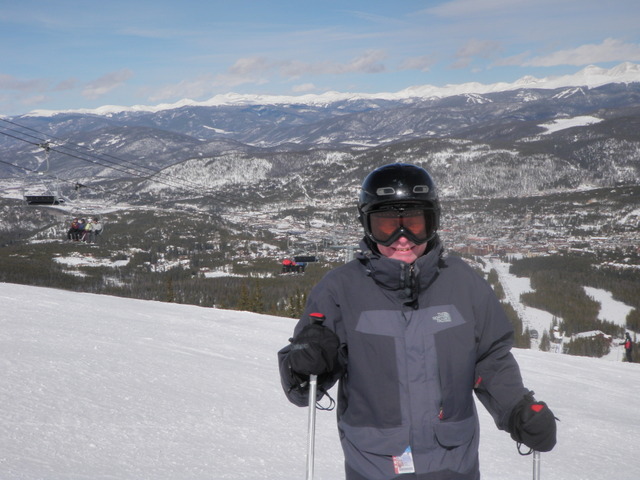 This all brings me to my day on Saturday March 2, 2013 at Breckenridge. Breckenridge had received a nice amount of new snow during the previous week, although there was no new accumulation on Friday night before we made our appearance on Saturday morning. The area was unbelievably crowded with several lift line waits approaching 30 minutes, but Jane and I persisted and were rewarded with some great skiing in the afternoon. The air temperature climbed into the 40’s and the sun was bright with no clouds in the sky. This was my fifth ski outing of the year, but my legs were feeling reasonably fresh as we discovered shorter lift lines on Peak 10 and enjoyed some nice long groomed runs on Cimarron, Double Jack and Crystal. Next we migrated up the Superconnect back to Peak 8 and checked out Chair 6. Unfortunately at 2PM it was still mobbed with skiers so we continued down Lower Boneyard and Frosty’s Feeway. 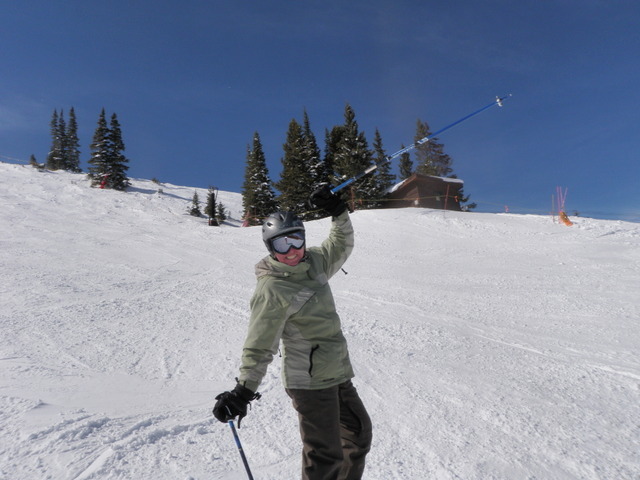 It was here that I discovered a nice stretch of category 2 moguls and in spite of only five days of skiing in the 2013 season and approaching age 62, I experienced some of my best mogul skiing. I was confident and applied all the keys described earlier. I bounced through this area twice and then demonstrated similar mastery of the moguls on High Anxiety before returning to Chair 6 just before it closed. Jane and I took one ride on Chair 6 and came down Lobo, a black diamond somewhere between 2 and 3, and the fun continued; absorb, quick edge, turn, absorb, edge, turn, etc. It was a fun afternoon as my feet remained warm and moguls were my domain, and I’m looking forward to a weekday trip this week. The quest for mogul mastery continues. 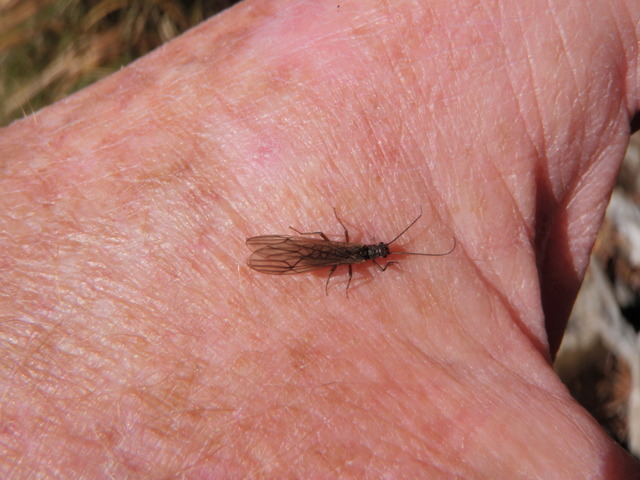 During two late fly fishing outings to South Boulder Creek I encountered a small black stonefly hatch. During the first meeting I was able to catch a few fish using a size 16 deer hair caddis that was tied sparsely; however, I felt I could have done better with a fly that more closely imitated the natural stoneflies. I returned to my vise and produced some decent size 18 black stonefly imitations that used a dark coastal deer hair wing and dark olvie brown dubbing for a body. On a return to South Boulder Creek on 10/23/2012 this fly produced nicely in the afternoon, but I felt it was still a bit large to match the naturals in South Boulder Creek. 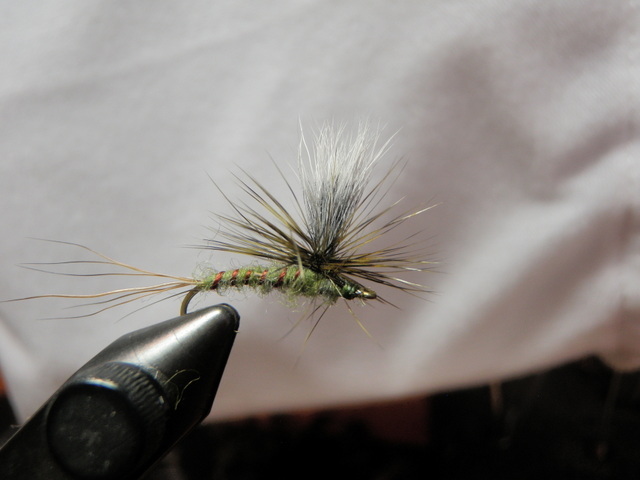 My friend Jeff Shafer has been tying stonefly adults using sculpin wool for wings and suggested I give this a try. Jeff had mailed me several chunks of this material so I produced three or four with sculpin wings. I never returned to South Boulder Creek to test this pattern, but I did try them out on the Big Thompson River late in the season, and landed several fish. The dark body and charcoal wool wing make this fly extremely difficult to follow on the river, but it is a very close reproduction of the natural insect. Not wanting to fall short on my inventory of small black stoneflies, I crafted ten size 20 flies using the sculpin wool for a wing. There are probably addtional hatches of small caddisflies where this fly might produce as well, so I am armed with some small stonefly and caddis imitations for the coming season.